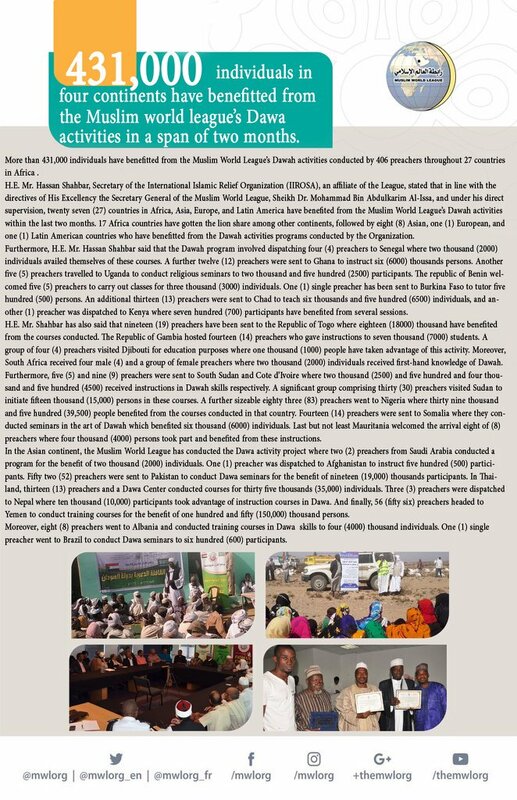 More than 431,000 individuals have benefitted from the Muslim World League’s Dawah activities conducted by 406 preachers throughout 27 countries in Africa . H.E. Mr. Hassan Shahbar, Secretary of the International Islamic Relief Organization (IIROSA), an affiliate of the League, stated that in line with the directives of His Excellency the Secretary General of the Muslim World League, Sheikh Dr. Mohammad Bin Abdulkarim Al-Issa, and under his direct supervision, twenty seven (27) countries in Africa, Asia, Europe, and Latin America have benefited from the Muslim World League’s Dawah activities within the last two months. 17 Africa countries have gotten the lion share among other continents, followed by eight (8) Asian, one (1) European, and one (1) Latin American countries who have benefitted from the Dawah activities programs conducted by the Organization. Furthermore, H.E. Mr. Hassan Shahbar said that the Dawah program involved dispatching four (4) preachers to Senegal where two thousand (2000) individuals availed themselves of these courses. A further twelve (12) preachers were sent to Ghana to instruct six (6000) thousands persons. Another five (5) preachers travelled to Uganda to conduct religious seminars to two thousand and five hundred (2500) participants. The republic of Benin welcomed five (5) preachers to carry out classes for three thousand (3000) individuals. One (1) single preacher has been sent to Burkina Faso to tutor five hundred (500) persons. An additional thirteen (13) preachers were sent to Chad to teach six thousands and five hundred (6500) individuals, and another (1) preacher was dispatched to Kenya where seven hundred (700) participants have benefited from several sessions. H.E. Mr. Shahbar has also said that nineteen (19) preachers have been sent to the Republic of Togo where eighteen (18000) thousand have benefited from the courses conducted. The Republic of Gambia hosted fourteen (14) preachers who gave instructions to seven thousand (7000) students. A group of four (4) preachers visited Djibouti for education purposes where one thousand (1000) people have taken advantage of this activity. Moreover, South Africa received four male (4) and a group of female preachers where two thousand (2000) individuals received first-hand knowledge of Dawah. Furthermore, five (5) and nine (9) preachers were sent to South Sudan and Cote d’Ivoire where two thousand (2500) and five hundred and four thousand and five hundred (4500) received instructions in Dawah skills respectively. A significant group comprising thirty (30) preachers visited Sudan to initiate fifteen thousand (15,000) persons in these courses. A further sizeable eighty three (83) preachers went to Nigeria where thirty nine thousand and five hundred (39,500) people benefited from the courses conducted in that country. Fourteen (14) preachers were sent to Somalia where they conducted seminars in the art of Dawah which benefited six thousand (6000) individuals. Last but not least Mauritania welcomed the arrival eight of (8) preachers where four thousand (4000) persons took part and benefited from these instructions. In the Asian continent, the Muslim World League has conducted the Dawa activity project where two (2) preachers from Saudi Arabia conducted a program for the benefit of two thousand (2000) individuals. One (1) preacher was dispatched to Afghanistan to instruct five hundred (500) participants. Fifty two (52) preachers were sent to Pakistan to conduct Dawa seminars for the benefit of nineteen (19,000) thousands participants. In Thailand, thirteen (13) preachers and a Dawa Center conducted courses for thirty five thousands (35,000) individuals. Three (3) preachers were dispatched to Nepal where ten thousand (10,000) participants took advantage of instruction courses in Dawa. And finally, 56 (fifty six) preachers headed to Yemen to conduct training courses for the benefit of one hundred and fifty (150,000) thousand persons. Moreover, eight (8) preachers went to Albania and conducted training courses in Dawa skills to four (4000) thousand individuals. One (1) single preacher went to Brazil to conduct Dawa seminars to six hundred (600) participants.